Resumes, cover letters, and job application forms are the commonly known documents thath are used during the hiring process. However, job applicants are not the only individuals who will need the usage of job-related forms but also hiring managers and the staff of the company to conduct proper interviews and complete the job candidate position selection. 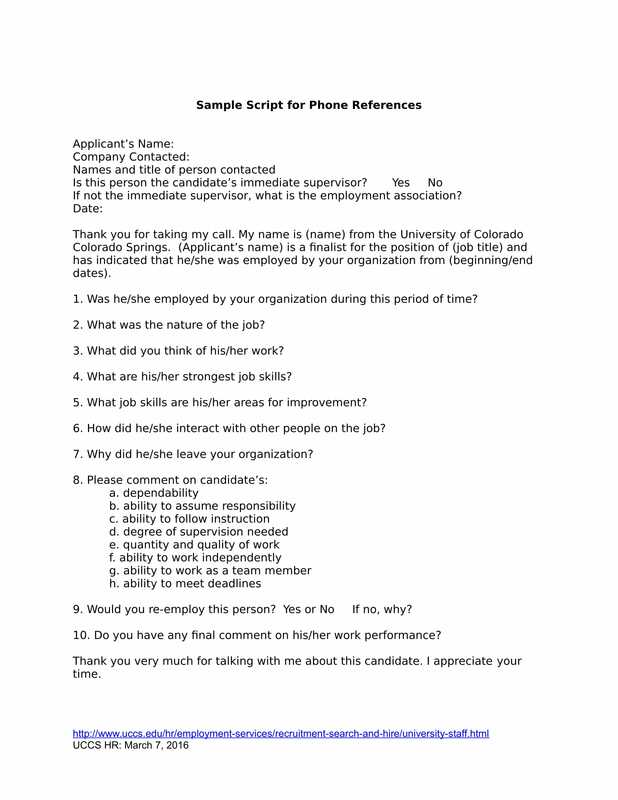 One document that will serve a great purpose for these hiring managers is a reference check phone script form used for inquiring and interviewing the candidate’s previous company. 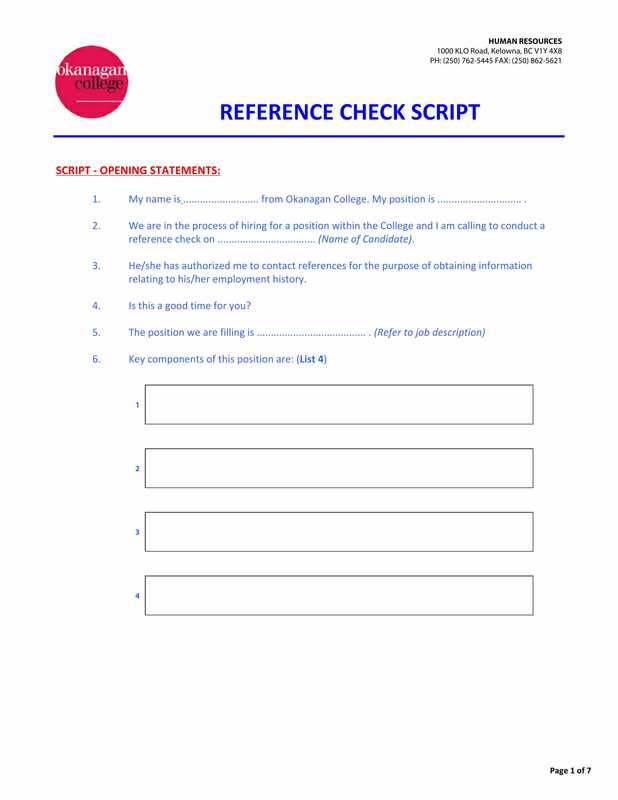 What Is a Reference Check Phone Script Form? 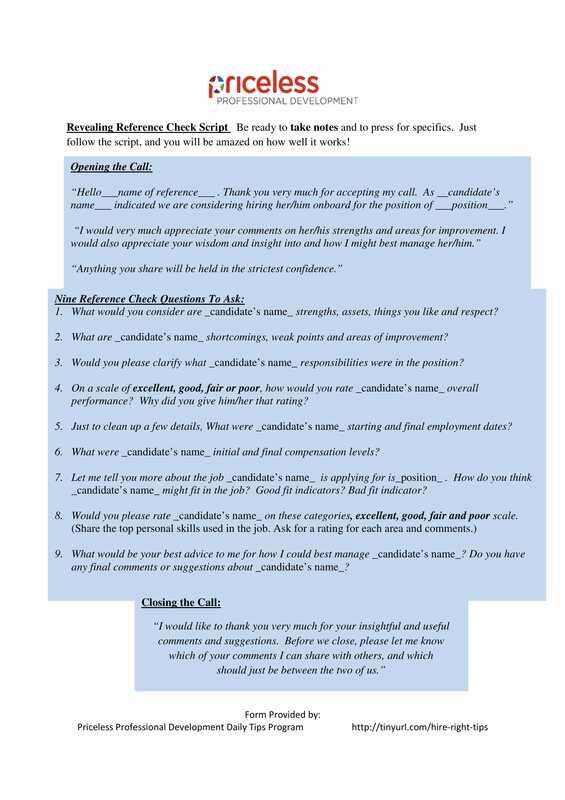 A reference check phone script form is used by hiring managers and human resource personnel to guide them toward choosing the right candidate during their job application process. With the script, the user will have an outline and will know what sorts of information he should gather for further analysis about their applicants. Although the script contains all the valuables that the user may ask the other person on the phone, ad-libs or unscripted comments and statements are also important as this will promote confidence and trust for both parties. 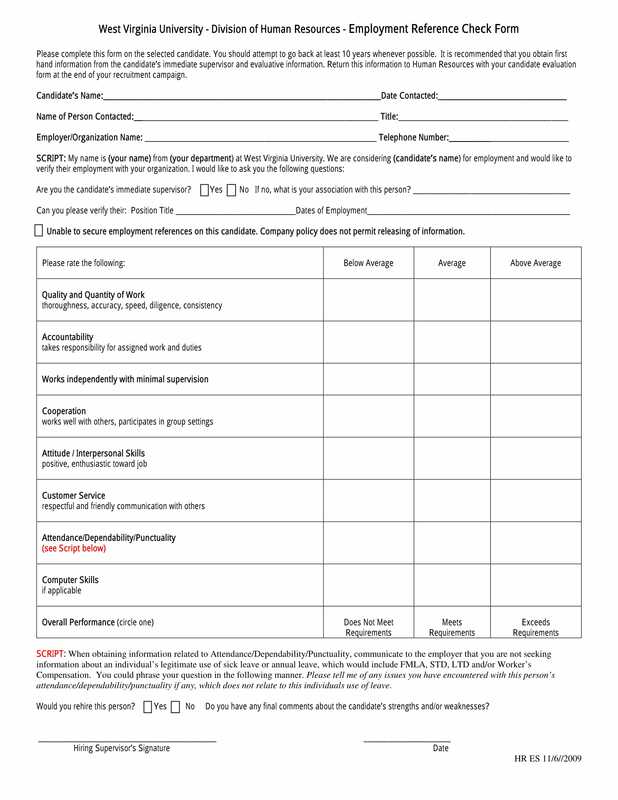 Additionally, this script form should be used only after filtering the final candidates for the job who are qualified to undergo an employment history and background check from the listed character references on the candidate’s resumes. 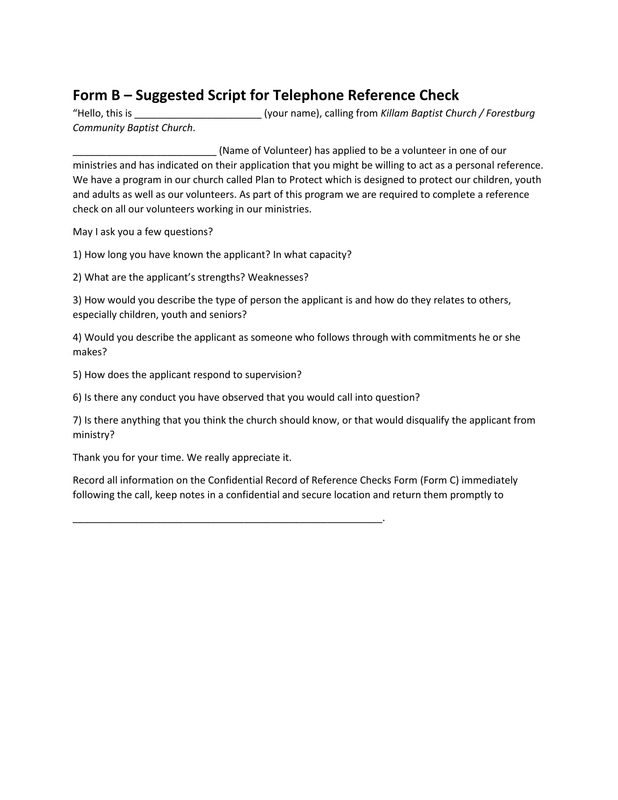 What Contents Are Inside Reference Check Phone Script Forms? This section will contain the name and the position wherein the candidate is applying to be part of. If the applicant has been referred to by an employee in the company, the referee’s name should be indicated especially if the company allocates bonus amounts for referred candidates who successfully got hired after the application. 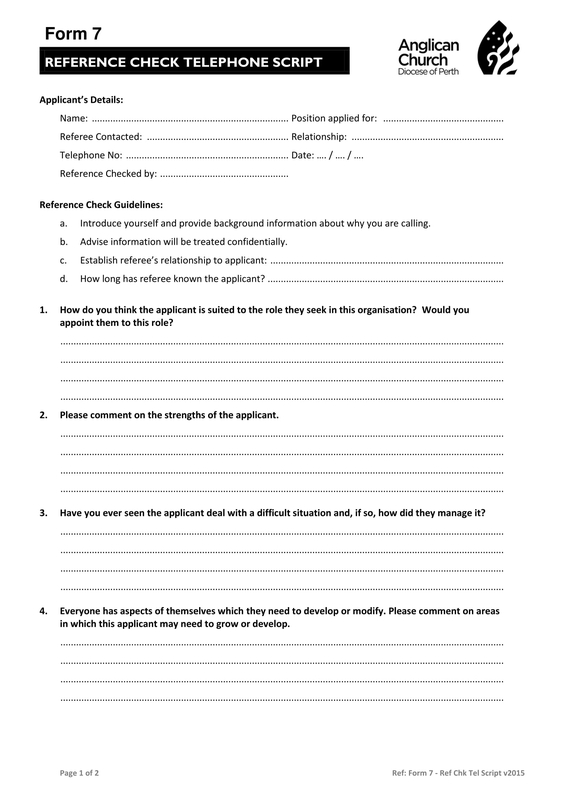 Other details stated in this section includes the relationship of the applicant and the referee, their contact information, and the date when the reference check is done. 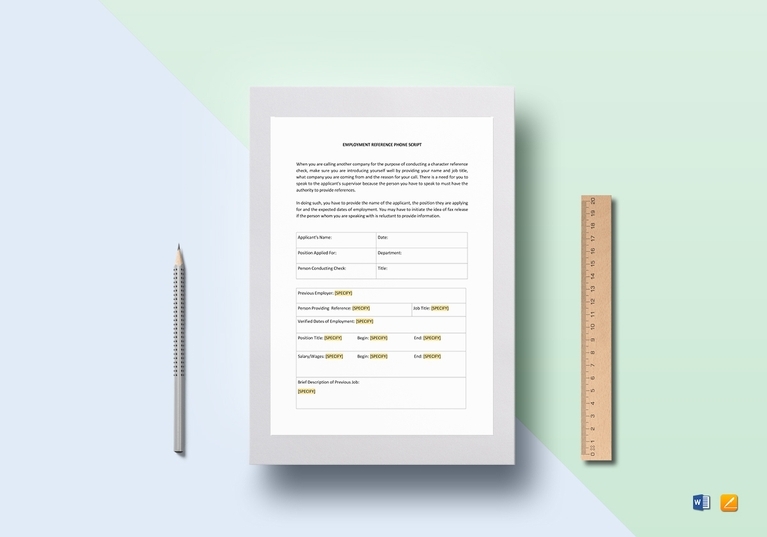 The first four steps that the user of the form or the character reference interviewer will do are stated in this section. Basically, the interviewer will need to open an introduction of himself and the reason of why he is calling. As part of the introduction, it is vital that the interviewer will include a confidentiality statement to secure the other person on the phone that the details he will be providing are only used for employment intentions and purposes. 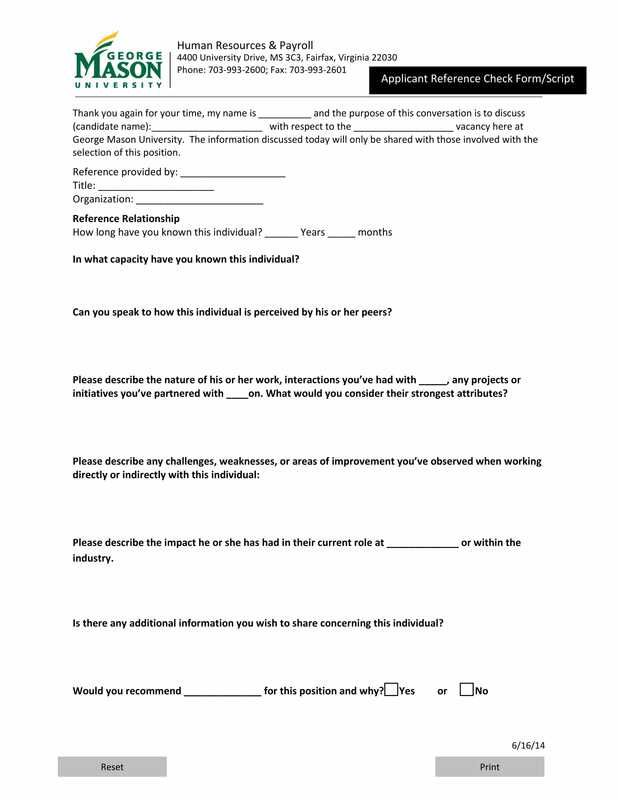 The last two steps focus on determining if the claim of the job candidate about his relationship with the reference person is factual as well as in knowing the length of relationship that the two had. 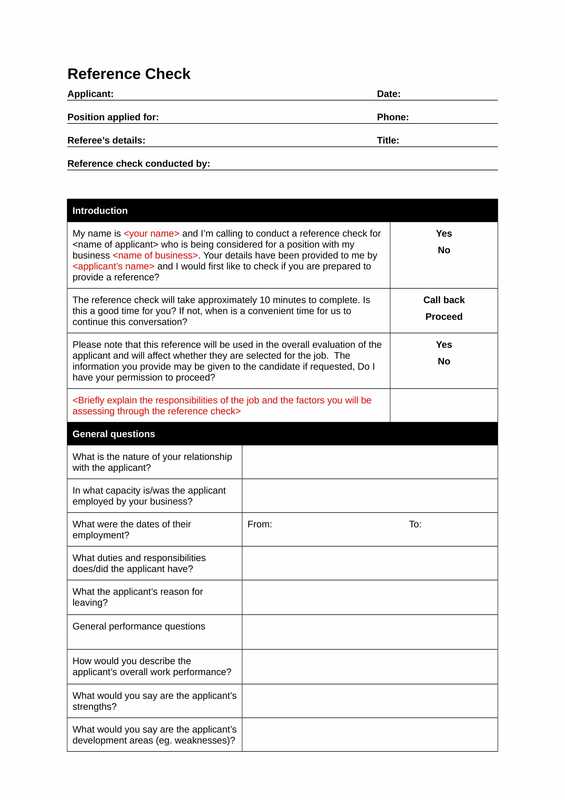 Some companies prefer to use an enclosed interview questionnaire form rather than incorporating the questions immediately on the script form to allow a huge space allocated for the answers of the reference person. 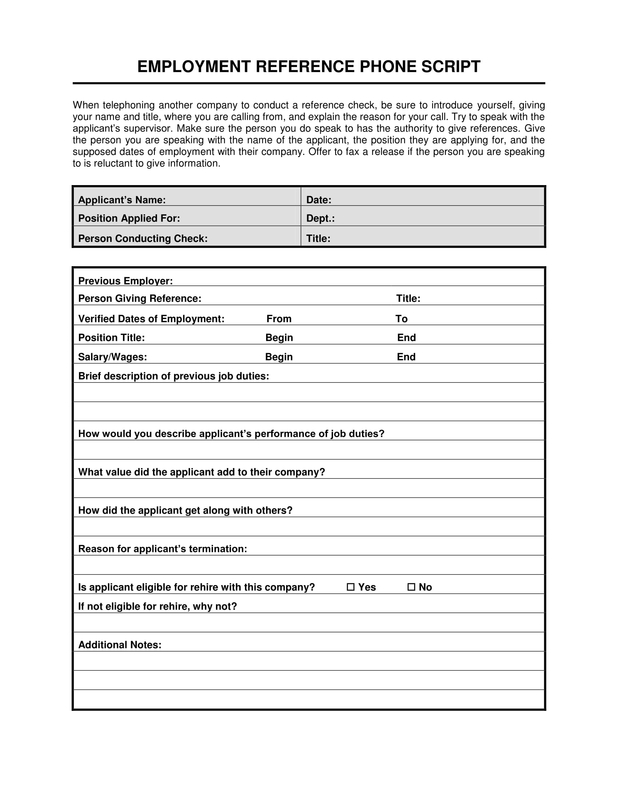 Nevertheless, the questions must center on the suitability of the job candidate for the position that he is applying, the candidate’s strengths and abilities, description of experiences working with the candidate, and an indication of whether the candidate will be recommended to be hired for the position or not. As the interviewer and the person from the other line of the phone communicate, the interviewer needs to conduct an interview assessment. The assessment is important in distinguishing falsified answered and claims provided by both the job candidate and the person being interviewed as the character reference. 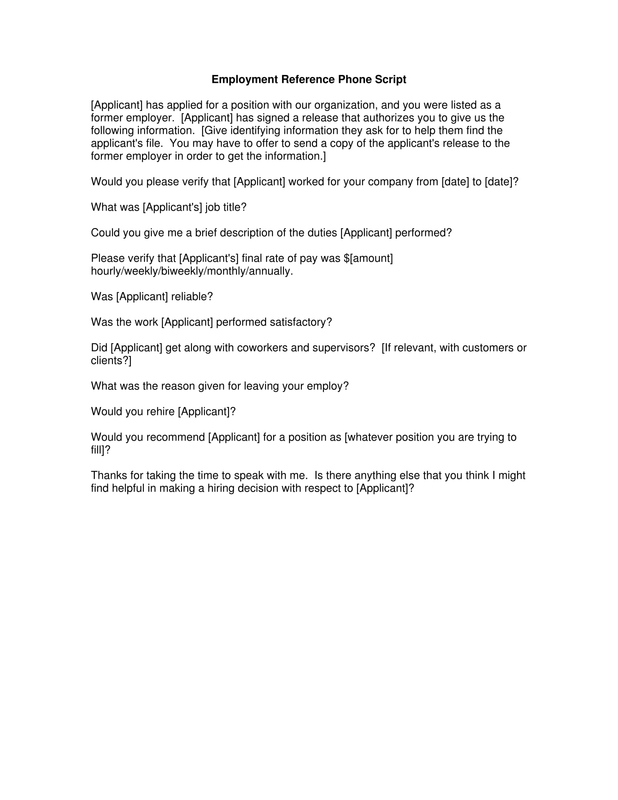 The level of enthusiasm for the other person to state the details about the applicant is included in this assessment along with the indication of whether there was hesitation in giving answers and feedback. With the comments stated by the interviewer in this section, the management will know if the character references listed by the applicant were professional people who are knowledgeable about the candidate’s previous work experiences. 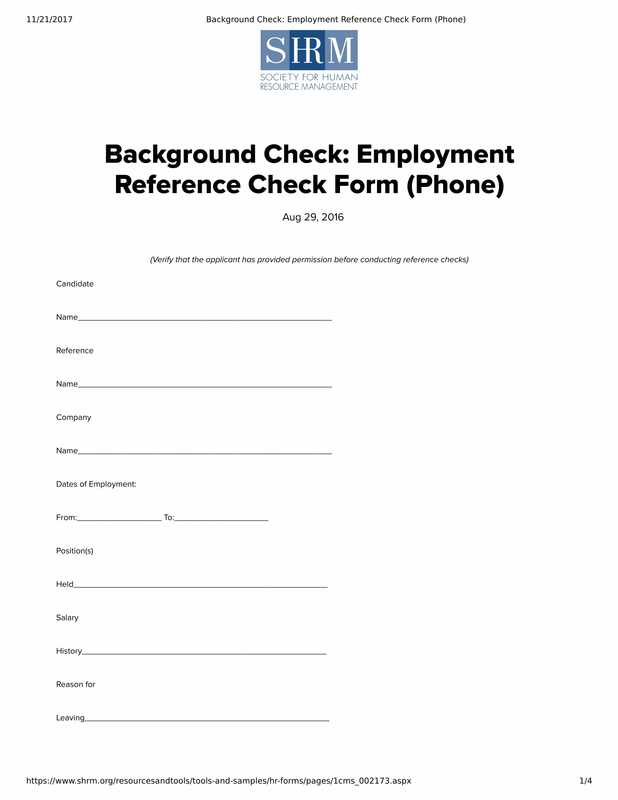 Since companies have more than a single interviewer or reference checker for varying job positions, the name and the signature of the employee who did the checking and assessments must be stated in this section. Additionally, the date of when the interview was completed will also be needed for proper record-keeping in the files of the management or human resource department. The date will also serve as the period of when the candidate may be called to be hired or to inform about the declined job application. 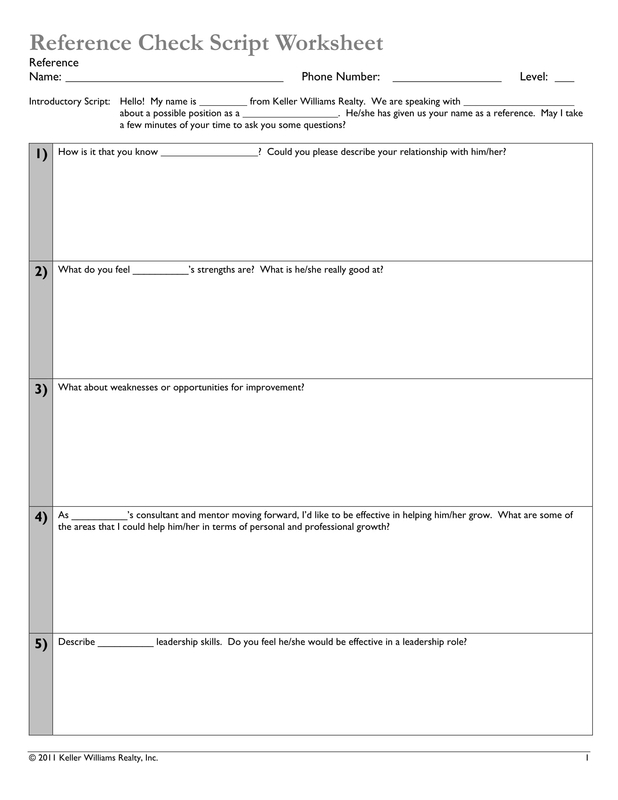 What are the specific areas wherein the applicant needs to modify himself or improve? This question will inform the current employer about the limitations of the applicant or job candidate when it comes to performing his tasks and responsibilities. As a benefit of this question, the limitations of the applicant will allow the interviewer to know the levels of training that the applicant may need and the specific lessons to integrate for the applicant’s improvement. The downside, some companies will not consider hiring individuals who have not yet bloomed as a fully grown professional in a specific industry or field, which will hinder the applicant’s ability to be granted with an approval to become an employee in the company. How would you rate your experience with the applicant in the workplace from a rating of 1–10, 1 for unsatisfactory and 10 for very satisfied? The rating that the former employer will give is important for determining the applicant’s ability to maintain professionalism and effective workmanship with his colleagues in the company. If the applicant was granted a poor rating, this signifies that the applicant may have communication and socialization issues that may be needed for qualifying for the job that he is currently applying. What are the inappropriate behaviors of the applicant he showed during his employment in your company? Good behavior is significant to everyone who aims to acquire a professional background and quality feedback from his superiors. With this question, the interviewer will know if the applicant has been involved in previous workplace complaint as the suspect or the person being complained to by the complainant. However, there are companies who will not disclose such details to outside parties to protect the dignity and the name of the company, which is why an agreement or a confidentiality statement must be approved by both parties before going to deep details about an applicant. 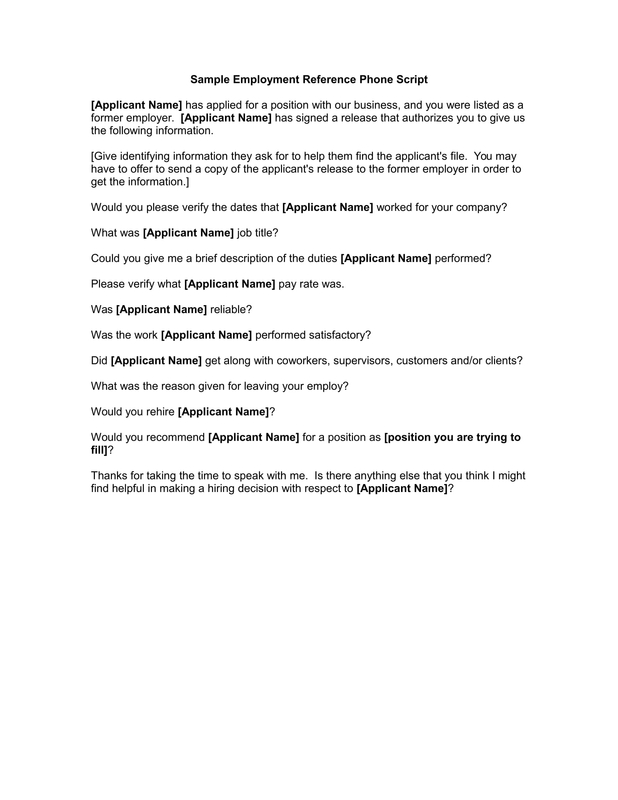 Are there other relevant information that we should know about the applicant? This is when the interviewer will be receiving descriptions of the applicant’s current awards as well as the medical state of the applicant that may have hindered in his ability to complete recommended tasks. In a case that the former employer of the applicant disclosed a medical information that indicates a hindrance for the applicant to do his regular task, the interviewer must list the details for verification of whether the deficiency and illness of the applicant are real and if the job will trigger the illness or not. Checking references is one of the known crucial steps in the job application process of a company since this is when the current employer will be introduced to the former employer of the job applicant. Other than that, both employers will be talking about the job candidate whose ability to be hired will weigh depending on the answers that the former employer provides during the interview. If you are the hiring manager who will be conducting the reference checking process, the first tip that you must keep in mind is to standardize the usage of the form of the whole company and customize it for varying job positions. Customization does not need to have a different format, outline, or even arrangement and color blocking but it must include all the necessary information that needs to be gathered for detailing the job candidate’s skills and background. Another tip is to appropriately listen, take note, and record each vital statement provided by the other person. To secure that you will not run out of space for your notes, prepare sheets of papers on your table and a pen that is functional and will sustain for the whole interview session. Online and software applications available on your laptops or computers can also be considered to attain the eco-friendly goal of your company. 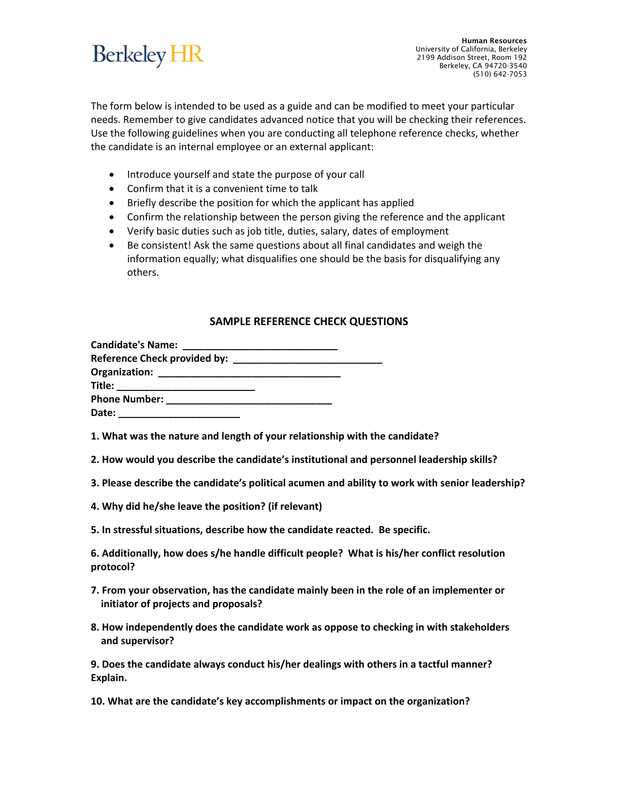 Lastly, as a manager or the interviewer, you must file the completed script with the application form of the candidate. These enclosed documents will be used for reviewing each application and in selecting who will be considered for the final interview.